The return of Abarth is near. If you'll recall, the motorsports firm of Carlo Abarth spent the 1950s and 1960s building race-winning cars sports cars that showed up many a big name. It also built tuning kits for Fiats, and was eventually taken into the bosom of the Agnelli dynasty. Now, Fiat's reviving the name for a new factory tuner and a rally team. 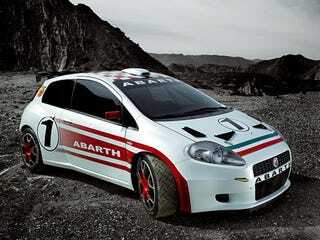 The Grande Punto Abarth will appear at the Geneva show with its rally cousin, the Abarth S2000. Both bear the Scorpion logo, but it's the rally car that's the true scion of Carlo. The four-wheel-drive S2000, built for the International Rally Championship, produces 270 hp, while the Punto Abarth creates 150 hp from a 1.4-liter turbo, though an add-on tuning kit will boost power to 180 hp. It'll also get a six-speed, Brembo stoppers, an aero kit and wider meats. Yes, please. A great project will be launched at the 77th Geneva International Motor Show: the rebirth of one of the most prestigious brands in world motorsports. Its symbol is a scorpion, and its name is Abarth. Abarth has always been synonymous with assertive cars, competitiveness, passion and excitement, and it now returns with a new range that will appeal to all lovers of motorsports. Abarth's first interpretation of the Grande Punto will be on the "catwalk" at the Geneva Show, the first step in an initiative which will later involve other models. This new adventure starts in the familiar, uniquely emotional context and exclusive setting of the Geneva Motor Show. A striking stand has been prepared, in line with the philosophy of Abarth's rebirth, an innovative space with a fresh, contemporary, technological language and great attention to every detail. The new elements that will publicise the Abarth brand are displayed with all their strong, original personality: the revamped version of the famous Abarth racing stripe has been rendered with LED tiles, while the new logo, the scorpion and the wording are all large, three-dimensional elements in polished, satin-effect aluminium. The Abarth values and tradition on the other hand are underlined discreetly and technologically: refined materials and precious finishing details in aluminium, carbon fibre, enamel and lacquer decorate the exhibition area, and draw attention to the true stars of the stand: the Grande Punto Abarth S2000, a car that has been type-approved for racing and is proving to be highly successful, and the Grande Punto Abarth Preview, a concept car making its world debut. These are the two souls of the Abarth world: racing and standard production. Visitors to the Geneva Show will also have an opportunity to discover a third field in which the brand operates; a multimedia configurator will illustrate the whole concept of the 'Abarth Kit', and the flexibility and wide range of combinations that the brand will offer customers in its conversion kits. Some of these solid wooden boxes, inlaid with satin-finished aluminium trims, are on display inside glass cubes, with the historic mechanical and stylistic components from the conversion kits. And finally, by means of exclusive LED technology and plasma screens, the walls of the stand propose historical photographs and films, alternating them with a reproduction of the new Abarth racing stripe, underlining the fine link between the past and the future, as well as the energy and personality that are inherent in the Abarth brand. The absolute star of the stand is the Grande Punto Abarth Preview, a true jewel of assertiveness and elegance. The car will be marketed in September, to enhance the sporty, youthful positioning of the Grande Punto. The car on show in Geneva is equipped with a 1.4 Turbo petrol engine that delivers 150 bhp at 5500 rpm, boosted to 155 bhp by the adoption of 98 RON petrol. What is more, thanks to a booster kit, a version with twice as much power as the basic version (180 bhp) will soon be available. This is a revival of a tradition from the past: for example, the Fiat 500 of 1958 delivered 13 bhp at 4000 rpm with a top speed of 85 km/h, while the Fiat 500 Abarth of the same year delivered 26 bhp at 5000 rpm and a top speed of 118 km/h. The Grande Punto Abarth aims to revive the feats of these entertaining performance cars, offering young drivers in particular an opportunity to enter the racing world in complete safety and at an accessible price. The public in Geneva will also be able to admire the extraordinary Grande Punto Abarth S2000. This is a racing car designed for racing stables, which the Fiat Racing Department will be entering in the 2007 Italian Rally Championship with Giandomenico Basso and his navigator Mitia Dotta. Davide Gatti, winner of the 2006 Fiat Abarth International Trophy, will compete at the wheel of an official Fiat Grande Punto R3D with a diesel engine. On the international scene, the Grande Punto Abarth S2000 will compete in the IRC (Intercontinental Rally Challenge) with drivers Andrea Navarra, his navigator Guido D'Amore, and young Umberto Scandola and Anton Alen. Powered by a 2000 cc aspirated engine that delivers 270 bhp, with 4-wheel drive, the new Grande Punto Abarth S2000 is heir to the version that took the 2006 Italian Rally Championship title with Paolo Andreucci and Anna Andreussi, winning 7 of the 11 races on the programme. Nor must we forget the excellent season of their team-mates Andrea Navarra and Guido D'Amore who took third place. Giandomenico Basso and Mitia Dotta won the European title and the International Rally Challenge. And finally, as well as a successful car and an outstanding team of drivers, the new Abarth & C. company can also boast a staff with a great deal of experience in motorsports: a total of 113 experts, 26 in the engineering field, 43 on the manufacturing side and 9 dedicated to racing.